Does my puppy look like a pure German Shepherd? Just got him recently, he turned 8 weeks in this picture. And is it normal for some sheps to have a distinct white tip on their tails? All his other siblings didnt have the tip, but my little guy did. Now that is one cute puppy! What a little sweetheart! And the ears are up soooo good - but they don't look like German Shepherd puppy ears to me. A German Shepherd puppys ears would be at least half again the size of your pups (maybe even double) even at this young age. Your babies ears look much more like Husky or Malamute ears to me. Plus the feet are way too small. GSDs are known for being well endowed in the areas of feet and elbows as they mature and often times look really gawky as they mature before they get the image of what a adult German Shepherd should be. The color doesn't bother me any as white has been in the German Shepherd since before the breed was fully developed a loooooong time ago and I love the white tip - I think it adds personality and uniqueness to your little baby. But overall, just based on the picture you have sent me today, I would have to say that your puppy is not a "pure German Shepherd". But your puppy does have some German Shepherd like features. I'm just curious - didn't you see both parents when you picked up your puppy? But if I were you I really wouldn't worry about it too much at this point anyway. You have a beautiful new puppy to play with - give it all the attention, care, training and great nutrition that you can, and you will have a wonderful companion for the duration of its sweet little life. And enjoy that sweet puppy breath all you can because it only lasts such a short while. :) I really miss that..... Good luck! Comments for Does my puppy look like a pure German Shepherd? Hi, I just bought a male German shep puppy from a couple that had bought him but their older dog didnt accept him. 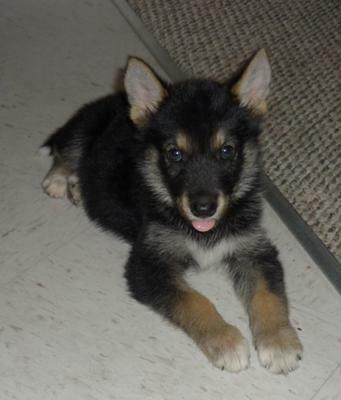 He is seven weeks old and almost identical to this puppy in the pic.Both parents looked to be pure bred gsd as well. I would love to see a more recent pic of the puppy to get an idea of what mine may look like. My puppy is 10 weeks with massive paws....to the point that my friend laughed the other day and said she has cankles! LOL. Also, at 10 weeks my girls ears are just beginning to perk up and they are a lot bigger than your cute pups ears. Your puppy is mighty cute though! I agree with the response, when I first looked at the puppy "Husky" was immediately came to my mind. Not pure, but mix.